LOS ANGELES: The Los Angeles motorcycle accident lawyers here at Riderz Law have learned of another unfortunate motorcycle accident. Last week, a California Highway Patrol officer was severely injured on his motorcycle while attempting to assist a broken-down vehicle. The officer, JD Fields of Northridge, was riding his motorcycle on the 134 freeway when he noticed a vehicle pulled over on the side of the road. Officer Fields put on his lights, moved into the right lane, and slowed down his bike to approach the vehicle. 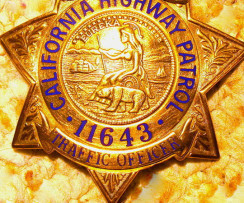 As the CHP officer slowed down, a woman driving a 2010 Nissan failed to see him and plowed into his bike—throwing him from his motorcycle and severely injuring him. The officer suffered a broken femur and broken wrist, among other things. Our prayers for a speedy recovery are with this CHP officer. Although the accident is still being investigated, it appears that this is yet another case of a careless driver failing to pay attention to the road. If a driver can’t see a CHP motorcycle with flashing lights, what chance do to the rest of us riders have?? As everyone who braves the LA streets and highways every day knows, there are a lot of, for lack of a better word, MORONS on the road. Unfortunately, accidents that would only result in a fender bender or body damage in a car can result in horrific injuries for motorcyclists. It’s unclear whether the CHP officer could have done anything to prevent the accident that occurred, but from the preliminary report, it doesn’t appear so. As motorcycle accident attorneys who see far too many motorcycle accidents in Los Angeles (and throughout California) every day due to negligence like this, we hope they throw the book at this careless driver. As always, if you or a loved one have suffered a personal injury due to a motorcycle accident in the Los Angeles area and would like a free consultation with one of our motorcycle accident lawyers, please call our toll free hotline or send us an email. We are available 24 hours a day, 7 days a week.